Darwinius masillae / Ida took 47 million years to become an overnight celebrity. Fig. 1A of the PLoS ONE article about the Ida fossil, published under the Creative Commons Attribution License; any re-use should cite the authors and journal. The background story to the new fossil discovery is quite fascinating and this page is an attempt to relate something of that fascination with the aid of a few pictures and images that have mainly been gleaned from the academic paper about the discovery presented, very conciously, "to the world," at the American Museum of Natural History in New York on May 19, 2009. For convenience of reference we today divide our planet's history into Eras, Periods, and Ages. Darwinius masillae / Ida actually lived some 47 million years ago in what we now refer to as the Middle Eocene Age. Eocene being a word of Greek derivation translating as "New Dawn". Palaeontologists consider that dinosaurs had died out some 18 million years before the Eocene and that it was in the Eocene that the first large land mammals made their appearance on the Earth. All those years ago, somewhere in a land that lay in the global latitude of today's island of Sicily there was a volcanic caldera lake surrounded by rich sub-tropical vegetation and teeming with billions of algae. The vegetation was sub-tropical partly because of the latitude in which it was growing but also because planet Earth, in those times, featured significantly higher average temperatures. Fossil evidence shows that this sub-tropical forest was bursting with very diverse life forms. There were the plants themselves and then there were, - again, all of 47 million years ago in the middle Eocene, - dragonflies, beetles, bats, birds, snakes, miniature horses, tapirs and crocodiles - to name but a few species. A very few and fragmentary fossil remains of Eocene primates had come to light previously to the discovery of the new fossil and had been examined and classified by palaeontologists. The new fossil find is said to be 95% complete and thus furnishes much more information allowing for interpretation and visualisation of how Darwinius masillae / Ida could have looked as a living creature. These sketched images of Ida, and her kind, are taken from the report published by the research team on the Public Library of Science web site. The overall image is Fig. S6 of the PLoS ONE article, published under the Creative Commons Attribution License; any re-use should cite the authors and journal. One day, all those years ago, a young, three-quarter grown, lemur-monkey that had perhaps been born as little as nine or ten months previously happened to expire possibly due to poisoning or suffocation due to some belching of noxious gases by the underlying volcano and its body ended up in the volcanic lake. It was these mortal remains of what was presumably a little regarded young lemur-monkey just trying to live beside a volcanic lake in the sub-tropical forest where it had been born that would eventually emerge in fossilized form into the full glare of world-wide attention, as Ida, or Darwinius masillae. 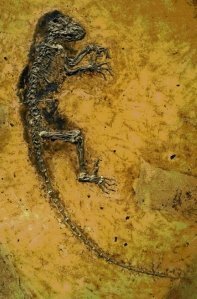 The new fossil discovery was made at Messel Pit and is big news today because the scientists who have just spent two years studying it claim to have found evidence showing that the fossil comes from a species new to science which they have given the name Darwinius masillae. They further claim that this new species was a very early example of a species which possessed several features which link it to the same branch of the Primate Family Tree as Human Beings. These features make the 47 million year old fossil a most important discovery in relation to a possible better understanding of Humanity's evolutionary past. A description of the conditions which allowed a young lemur-monkey that had come to an untimely end in the middle Eocene to ultimately emerge in our own times, all of 47 million years later, as a 95% complete fossil is one of the most fascinating and important aspects of the story. Largely due to the heavy population of algae, and to the limited inflows of oxygen-bearing water into this volcanic caldera, the lower levels of the lake were extremely poor in oxygen and this young creature's body was not disturbed by such bioturbations as would have resulted from larger aquatic life scavenging for food but was instead reduced to mineral forms by the quiet operation of bacteria. So quiet was the operation of these bacteria that these minerals even took the shape of what the bacteria consumed - be it hairs or bone. Due to this lack of bioturbation the fossil bodies of many of the fossils of other species that have previously been recovered from Messel Shale Pit are surrounded by a so-called Hautschatten ('skin shadow'). This dark area, formed out of fossilized waste materials discarded by bacteria as they slowly consumed deceased animals and birds, even preserves impressions of plumage on birds and the individual hairs of mammals. The wing membranes and details of external ears are known from bats. Such a degree of fossil preservation is the case with Ida and the researchers have even claimed that they can be certain she had almost recovered from a having a badly broken wrist and that her fossilized stomach contents show that her last meal was composed of fruit, seeds and leaves. One of the research team, Holly Smith, an expert in primate development at the University of Michigan, has described Ida as being "caught at a really very interesting moment [in its life] when it has all its baby teeth and is in the process of forming all its permanent teeth. So you have more information in it than almost any fossil ". Over perhaps a million years conditions prevailed where algae and other vegetation contributed carbon-rich materials as they themselves expired, and where these carbon-rich materials were joined on the bottom of the volcanic lake by sediments, muds, and rocks as deposited by geological and other processes, ultimately producing a substantial deposit some 200 metres deep of tarry shale. As time passed, carbon-rich depositions of organic and mineral materials accumulated and deepened. Ida, and thousands of other creatures including miniature horses, bats, snakes, tapirs, beetles and crocodiles that had similarly become mineralized, subsequently became fossilized, in layers of compressed carboniferous shale. It was this 200 metres deep bed of carboniferous "raw materials" that humans, 47 million years after the unfortunate demise of Ida / Darwinius masillae, found it economical to mine in order to process them towards the production of tars and paraffins. In these more recent times, when the resulting Messel Shale Pit was being quarried for its tarry deposits, such activity took place near Darmstadt in today's Germany as that part of the Earth's crust where our youthful creature had met its untimely end had "continentally drifted" across those 47 million years some 10o of latitude northwards. Very occasionally workers at the Messel Shale Pit would come across the fossilized remains of creatures who died long ago. There was a famous instance in 1875, very shortly after the Messel Pit began to be exploited for its brown coal, of the discovery of a fossilized crocodile. Some of these fossils found their way to museums but the shale, in its original situation as part of the bedrock of a pit lying below adjacent lands, was originally composed of some 40% water and blocks of shale tended to crumble away, together with any fossils they contained, as they dried out. It happened that the economic life of the Messel Shale Pit changed circa 1962 as tars and paraffins could be produced more cheaply in other ways. The pit was worked subsequently for its slate as a raw material for the production of concrete until 1971 when, in economic terms, the Messel Pit fell into disuse. There were proposals that the site could now become a landfill or dump. Amateur fossil collectors began to access the site as hobbyists, or for potential profit, even though this was being discouraged by the authorities who tried to fence off the site in 1975. The amateurs collectors, however, continued to access the site and found many interesting fossils showing unprecedentedly fine detail in their preservation due to the oxygen poverty long ago which had resulted in deceased specimens being slowly mineralised without bioturbation. They also developed transfer-preparation techniques where damp shale blocks retrieved from the pit were kept moist whilst the fossil hunters slowly and skillfully scraped away the surrounding matrix of rock exposing the fossil. Exposed fossil surfaces were then promptly dried with warm air and encased in a preserving and supportive coat of transparent polyester resin. Then, in 1983, some 47 million years after our unfortunate young victim had lost its life, the particular block of shale in which it was fossilized was recovered by amateur fossil collectors. The block of shale was split by these fossil hunters revealing our fossilized friend with the true fossil being contained in one portion and with the other portion bearing fossil features that were mostly just a counterpart, or corresponding impression, of the fossil itself. The fossil hunters took steps to preserve the find with resins so that it did not dry out and crumble away and some damage may have occured to the two portions of the fossil during these processes. The amateur fossil hunters seem to have subsequently kept their find pretty much to themselves. 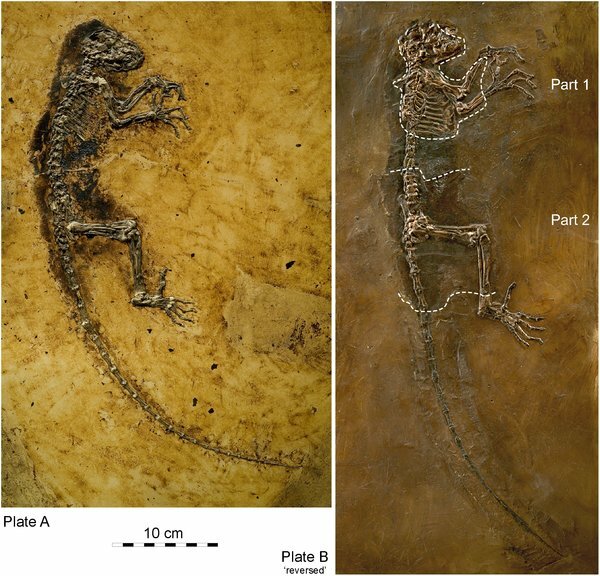 These pictures show the two portions of the Darwinius masillae / Ida fossil. If you look closely you can see that the portion to the right is a counterpart, "impression", of the one on the one of the left. The images are presented with one being mirrored to allow better comparison. One of the pictures is lineated with dashed lines and annotated as parts 1 and 2. These features are in place, in part, to describe areas where restorative "fabrication" had occured. Fig. 1 of the PLoS ONE article about the Ida fossil, published under the Creative Commons Attribution License; any re-use should cite the authors and journal. The much less complete counterpart portion found its way to a privately run dinosaur museum in Wyoming in 1991. In the 1980s the local authorities had dropped their to plans for the re-development of the site as a dump. The many spectacular successes in fossil recovery activity had helped to forestall the local authority from using the access roads it had by then purposely constructed to actually complete its plans for running the site as a well-managed landfill site. In 1995 the same Messel Shale Pit that had narrowly escaped becoming a landfill was awarded World Heritage Site status by UNESCO as a result of its established importance as a source of uniquely complete and detailed fossils. In 1997 the responsible authorities in Germany declared an amnesty on any fossils irregularly collected from Messel Pit prior to 1995 both to regularise the situation and also in the hope of allowing important fossils to be brought to scientific attention. The Darwinius masillae / Ida study project apparently had its origins in December, 2006, at a mineral and fossil fair in Hamburg, Germany, where Dr. Jørn H. Hurum of the University of Oslo got into conversation with a private fossil dealer named Thomas Perner who was already known to him. The fossil market seems to be a little bit shadowy, and that the very best fossils may not actually be on display but are traded more clandestinely. Thomas Perner suggested that if Dr. Hurum were to meet him later he would have something interesting to tell him about. At this later meeting over fruity vodka drinks at an establishment on the Reeperbahn, Thomas Perner showed Dr. Hurum a few photographs of a fossil, which had been found at Messel Shale Pit in 1983 and had subsequently been hanging on the wall in the house of a German collector. Herr Perner discreetly advised Dr. Hurum that the fossil had already been quietly "on the market", to selected museums, for some six months at an asking price of, wait for it, more than $1,000,000. 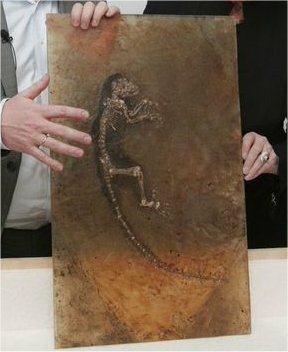 It seems that at least two prominent German museums, the Senckenberg Museum in Frankfurt and the Hessian Landesmuseum in Darmstadt, had already been approached, possibly with the same or similar photographs, but had baulked at this asking price for a fossil that they had not found to be of proven merit. A certain amount of forgery, fakery, and interpretative reconstruction, is known to go on in the fossil-collecting world so participants in the fossil market need to be both knowledgeable and careful. Back home in Norway Dr. Hurum reported news of this extra-ordinary fossil and its equally extra-ordinary asking price to his colleagues. Dr. Jørn H. Hurum, pictured here with Kimmerosaurus, a plesiosaur, being excavated in 2004, seems to have been something of a fossil fanatic from an early age having reputedly, when he was less than 10 years old, made the 50km train journey to Oslo from his home town, clutching a rucksack full of fossils he had collected in order to find out more about them at Norway's Natural History Museum, where he now works. That visit, during which he got to talk to an expert on trilobites, was only the first of many that he made seeking detailed information. Dr. Hurum was extremely keen that some reputable Natural History Museum should purchase this fossil rather than that it should be bought by a private collector who might effectively hide it away for private appreciation and without its scientific value being understood. Although Dr. Hurum does not seem to have actually actually expected it, funds were found by the Natural History Museum, University of Oslo, Norway where he was himself working as a vertebrate palaeontologist, such that he was able to enter into negotiations leading to the purchase of the fossil. The purchase price was later reported as being something less than $750,000. During the finalisation the purchase Dr. Hurum appears to have only been allowed by the sellers to very briefly inspect the physical fossil but some x-rays were taken to establish the underlying veracity of the appearance of the fossil's skeleton. The fossil that Dr. Hurum had purchased was, in fact, from the more truly "fossil bearing" portion of the block of shale split by the amateur collectors in 1983 and proved to be sufficiently interesting to allow the calling-in of scientific expertise from around the world to examine, to describe, and to classify. 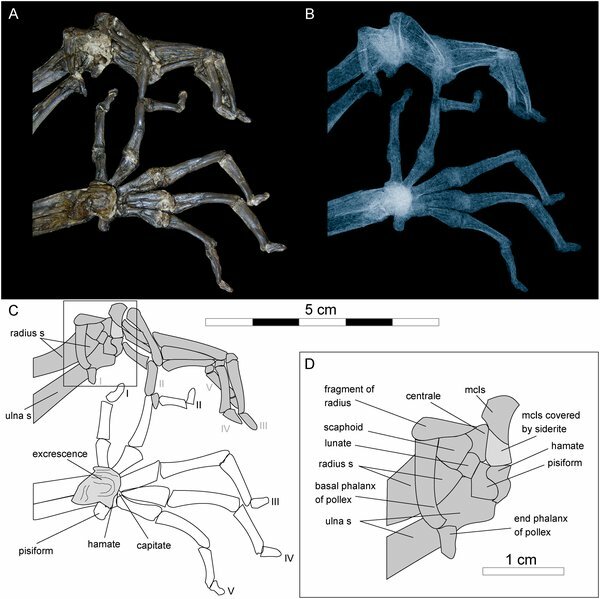 Images of the hands and wrist of Darwinius masillae as taken from, and as explicitly so described in, the report published by the research team on the Public Library of Science web site. The academic study of Darwinius masillae / Ida fossil discovery has produced many pictures and images in various formats including photographs, diagrams, sketches and x-rays. One of the pictures, "picture A", seems to be on track to provide Darwinius masillae / Ida with her Defining Icon. This picture of her hands, which seems to show that her fingers articulated quite like our own, seems to particularly capture public interest and attention. The image is Fig. 9 of the PLoS ONE article, published under the Creative Commons Attribution License; any re-use should cite the authors and journal. Dr. Jørn H. Hurum had been previously involved in Palaeolontological studies which had "partnered" with television and other media. It happened in the case of this extra-ordinary fossil that the scientific team, on terms satisfactory to themselves and the institutions they represented, joined forces with commercial media. The scientific labours of examination, description, and classification were accomplished with much secrecy, largely so that important scientific work could be undertaken undisturbed but also to achieve a greater eventual impact. This secrecy had a perhaps unintended outcome as the accepted procedures for the naming of a new species were not adequately followed. "Darwinius" was hit upon to honour Charles Darwin as 2009 was the the 200th anniversary year of his birth and this was put together with masillae as the latin term for Messel. But this composite latin term for a new Genus and species should have appeared in print in some academic context prior to being fully validated and this did not occur during the period of strict secrecy. Due to the involvement of the commercial media things were put in place such that on the day that the new Darwinius masillae / Ida discovery was to be "announced to the world" as a very early primate specimen, she would already have been the subject of an exhaustive two-year study by an international team of experts, have her own TV specials "in the can" for American and for International audiences, a book deal, and her own extensive web site. There were by now a large number of people involved in the project, the researchers themselves of course, their commercial associates, TV crews, publishers, web designers and allied trades and professions. Those involved had typically been obliged to sign binding secrecy agreements. The study team were able to satisfy the academically prestigious New York based American Museum of Natural History that the fossil discovery was of sufficient importance for the museum to allow the discovery, and the scientific findings based on it, to be made public within its hallowed walls. The date of the announcement was set for May 19, 2009. The story did not really "leak" until, on May 10, apparently after one of the researchers gave an incautious and 'on the record' interview, when the English "Mail on Sunday" ran a related story complete with illustrative pictures, images, and graphics, that was gradually picked up on world-wide. 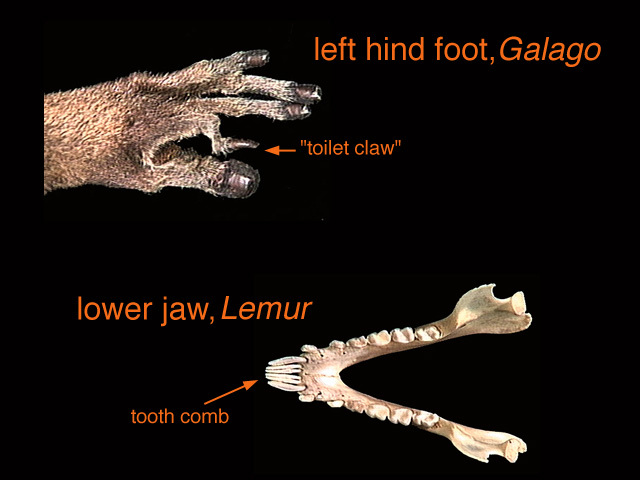 It seems that the new fossil discovery differs from lemurs in two key ways - it does not possess the "toilet claws" on the second digit of the hind feet the lemur family tend to use for scratching and grooming or the "toothcomb" fused row of teeth in the middle of the lower jaw that lemurs use to groom fur. These two key differences lead the researchers to depict Darwinius masillae / Ida as having been a "Lemur-Monkey" rather than a Lemur. "MEDIA ALERT," - "WORLD-RENOWNED SCIENTISTS REVEAL A REVOLUTIONARY SCIENTIFIC FIND THAT WILL CHANGE EVERYTHING." At the launch presentation itself T shirts featuring the slogan "The Link : This changes everything" were seen in the crowd. Comparisons of cultural importance were made with the Mona Lisa and to the Moon Landings. "Now people say, 'OK, we are primates. Show us the link.' The link they would have said up to now is missing -- well, it's no longer missing." The Google search page is frequently "themed" with individualized graphics put in place in celebration of major events - such as the Olympics. On 20th May, just after Ida was announced "to the World", the Google main search page featured an "Ida" theme. This particular Google main search page was background coded such that when visitors clicked on this Ida / Google logo they automatically Googled for "missing link found"! How far is all this ida-lization really justified? 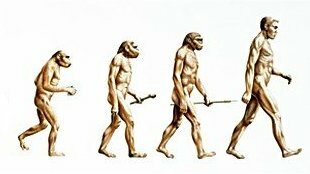 Will the claims that Darwinius masillae is a missing link to our own species prove to be specious? Three of the research team members - Holly Smith, Jens Franzen and Jørn Hurum - at the launch in New York. A close colleague of, and indeed, collaborator and co-author with, Dr. Hurum on the two-year study of the Ida fossil, Jens Franzen, former director of the Senckenberg Research Institute which has close links with the Messel Pit fossil site, was also at the launch ceremony during which he himself hailed the new discovery as "the eighth wonder of the world". Despite this ambitious utterance Dr. Franzen also stated that "we're not dealing with our grand, grand, grandmother, but perhaps with our grand, grand, grand aunt" and that "she belongs to the group from which higher primates and human beings developed but my impression is she is not on the direct line". Moreover, the closing sentences of the body of the academic study available online are perhaps somewhat restrained in the claims they seem make about this possible Missing Link fossil discovery. Morphological characteristics preserved in Darwinius masillae enable a rigorous comparison with the two principal subdivisions of living primates: Strepsirrhini and Haplorhini. Defining characters of Darwinius ally it with early haplorhines rather than strepsirrhines. We do not interpret Darwinius as anthropoid, but the adapoid primates it represents deserve more careful comparison with higher primates than they have received in the past. Darwinius masillae is important in being exceptionally well preserved and providing a much more complete understanding of the paleobiology of an Eocene primate than was available in the past. The researchers believe Ida may be on our own evolutionary line dating from just after the split with the lemurs and that this fossil is from "a transitional species showing characteristics from both the non-human (prosimians and lemurs) and human (anthropoids, monkeys, apes and man) evolutionary lines". 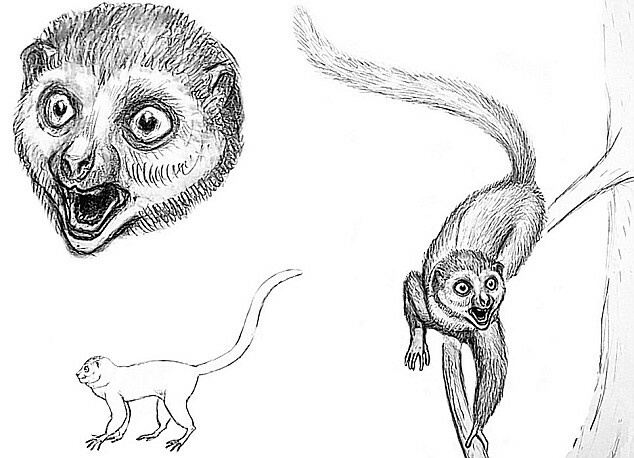 Prior to the discovery of this new, and unprecedentedly complete, fossil of an Eocene primate specialists in the field had been moreso inclined to place the Adapoids in the Strepsirrhine branch of the primates with present day lemurs, lorises and bushbabies. In the immediate aftermath of the launch an article "Why Ida fossil is not the missing link" by Chris Beard of the Carnegie Museum of Natural History in Pittsburgh, Pennsylvania, appeared on the web site of the respected science magazine New Scientist. 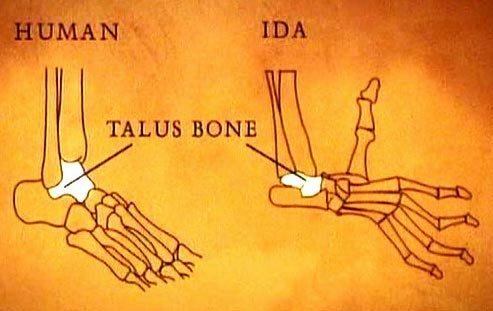 “What does Ida's anatomy tell us about her place on the family tree of humans and other primates? The fact that she retains primitive features that commonly occurred among all early primates, such as simple incisors rather than a full-fledged toothcomb, indicates that Ida belongs somewhere closer to the base of the tree than living lemurs do. The researchers have pointed to the fossil's talus, or ankle bone, which they see as having articulated quite like our own. The shape and articulation of the talus eventually, that is to say millions of years later, allowing monkeys, apes and humans to have a capacity to be bi-pedal and walk on two legs rather than four. All in all it has to be realised, in these early days, (written May 26th, 2009 - one week after the launch in New York), that expert opinion is, as yet, divided as to the full significance of the new fossil discovery. Quite a lot seems to hinge on this young female's ankle bone. It remains to be seen whether Ida will become accepted as an early Haplorhine, and thus as a possible missing link to the better understanding of the distant ancestry of Haplorhines. We Human Beings are deemed, by the scientists, to be on the Haplorhine branch of the Primate Family Tree. Science also considers us to be "anthropoids" and the other living species to which we are least distantly related to include Bonobos, Chimpanzees, Gorillas and Orang-Utans. The day after the Ida launch proceedings in New York the UK based Guardian newspaper featured a front-page article under Sir David Attenborough's personal by-line. "Humanity is very egocentric. We are fascinated with ourselves. I'm not sure that it is a particularly nice characteristic but we are. When we look round at the natural world, there is often an ulterior motive. We desperately want to know where we came from..."
"...The more you look at Ida the more you can picture, as it were, the primate in embryo. She represents the seed from which the diversity of monkeys, apes and ultimately every person on the planet came..."
A second new early adapid fossil discovery found in Egypt in 2001, dating from some 37 million years ago, that has been named Afradapis longicristatus, and is closely related to Darwinius, is described (October, 2009) in the prestigious science journal Nature by a team led by Erik Seiffert, of Stony Brook University in New York state. Their analysis of the two fossils indicates strongly that both Darwinius and Afradapis appear to be members of a group more closely related to lemurs and lorises than to monkeys, apes and people, which has left no known modern descendents. In this tree, adapiform primates like Darwinius and Afradapis are not placed close to higher primates, but rather are situated as closer relatives of the living lemurs and lorises, which are "prosimian" primates. The team led by Dr. Seiffert record the surprising discovery that the first African primates to evolve large body size and tooth and jaw features like those of the living catarrhine anthropoids (that is, the Old World monkeys, apes, and humans) arose from within this distantly related prosimian group (adapiforms) that includes Afradapis. Such early promisians could have attained mature weights of 20 pounds (9 kilos) in contrast to the 1-2 pounds mature weight they attribute to the contemporaneous early ancestors of all later anthropoids. Dr Seiffert holds that the Darwinius fossil is somewhat unreliable because its skull is crushed and its ankle damaged depriving science of two key areas of potential understanding of early primate evolution and has said that "when it comes to the key anatomical features that primate palaeontologists so often depend on, Darwinius is surprisingly uninformative". One hearing of this challenge Dr Hurum, and some of his colleagues, went on the record in declining to fully accept the Sieffert teams conclusions. Philip Gingerich, a palaeontologist-from Princeton University in the US who worked with the Norwegian on Ida, described the latest assertion as 'puzzling', adding that the creature was almost certainly part of the lineage that led to monkeys, apes and humans. In early March, 2010, another scientific paper - Williams, B., Kay, R., Christopher Kirk, E., & Ross, C. (2010). Darwinius masillae is a strepsirrhine--a reply to Franzen et al. (2009) Journal of Human Evolution DOI: 10.1016/j.jhevol.2010.01.003, appeared in the Journal of Human Evolution (to which it had actually been submitted for consideration some four months before the publication date of the paper by Sieffert and his colleagues). In this paper Williams, a visiting professor of paleontology at Duke University, Kay, an evolutionary anthropologist at Duke University, Kirk, associate professor of anthropology at the University of Texas at Austin, and Ross, an evolutionary biologist at the University of Chicago, argue that Darwinius lacks most of the key anatomical features that could demonstrate a close evolutionary relationship with living haplorhines (apes, monkeys, humans, and tarsiers). The lack of clear synapomorphies [shared derived characteristics] linking Darwinius to living and fossil haplorhines, the undisputed positive evidence that it is an adapiform, and the detailed evidence that adapiforms are stem strepsirrhines, suggests that Darwinius has little relevance for understanding haplorhine evolution. No, I do not regret the media blitz at all. Ida is still one of the most iconic fossils and the only complete primate fossil ever. Whether or not she is a direct ancestor - something we never claimed in the scientific paper - is just part of the story. She is undoubtedly the only fossil that tells us what an early primate really looked like, other fossils are mostly fragments. 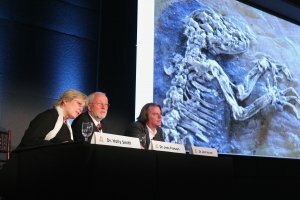 In early March, 2010, when the Williams, Kay, Kirk, & Ross, paper was published the Ida fossil was at the Senckenberg Museum in Frankfurt, Germany, where it was being Computed Tomography scanned in high definition. Dr. Hurum and his colleagues were understood to be working on a reply to the difficulties pointed out in the Nature paper and the Journal of Human Evolution paper. "with a proper understanding of ‘total evidence,’" - our studies - " reaffirm our earlier interpretation that Darwinius is a haplorhine important for understanding the transition to Anthropoidea". A note about "Total Evidence"
Total evidence was introduced in phylogenetic systematics by Kluge (1989) as an alternative to consilience. Kluge reasoned that a single most-parsimonious phylogenetic hypothesis based on all evidence considered together (‘total evidence’) is better than the consilience or taxonomic congruence of multiple phylogenetic hypotheses based on different subsets or partitions of evidence. According to Kluge (1989), the advantages of combining data of different kinds (e.g., morphological and molecular; fossil and living; dental, cranial, and postcranial) are: (1) observations from a spectrum of character systems are more representative of all of the available evidence; and (2) observations from a spectrum of character systems are more likely to be independent than are observations drawn from the same character system. The strepsirrhine-haplorhine dichotomy can be considered from a phylogenetic point of view, and the characteristics distinguishing strepsirrhines and haplorhines can be coded for cladistic analysis. In our earlier study (Franzen et al., 2009), we considered the relationship of Darwinius to Strepsirrhini and Haplorhini by compiling a list of 30 characteristics cited by authors as distinguishing these groups. Most came from the classic monographs on Strepsirrhini and Haplorhini by (Hill, 1953) and (Hill, 1955) and from the widely-used current primate textbook by Fleagle (1999). Figure 2. Phylogram showing the position of Darwinius relative to major groups of primates, based on data of Franzen et al. (2009). This represents one of two most-parsimonious cladograms in an exhaustive search of 10,395 trees (second cladogram differs only in showing Strepsirrhini as paraphyletic). Darwinius falls within crown-group Haplorhini (Tarsioidea, Ceboidea, Cercopithecoidea, and Hominoidea; node 13) as a stem anthropoid, and it does not group with Strepsirrhini (Lemuroidea and Lorisoidea; node 9). Analysis is based on 30 total-evidence characteristics distinguishing Strepsirrhini and Haplorhini (data from Table 3 of Franzen et al., 2009), with Tupaioidea added as an outgroup. It seems, however, that this paleantological ping-pong may continue for some time yet! so what about Human Nature? the Faith versus Reason Debate itself.